Lake Wanaka lies at the heart of the Southern Lakes, New Zealand's alpine wonderland, in the southwest of the South Island. Wanaka's township is situated in a dramatic glacier-carved basin on the shores of the lake and is the gateway to the Mt Aspiring National Park World Heritage Area. 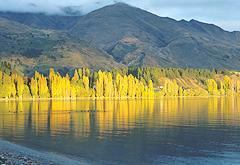 Lake Wanaka welcomes all comers: adrenaline addicts, foot-sore travellers, lovers of luxury. Take time to explore this exquisite piece of real New Zealand and revitalise your spirit.